Frame > Blog > What are the Three Rs? 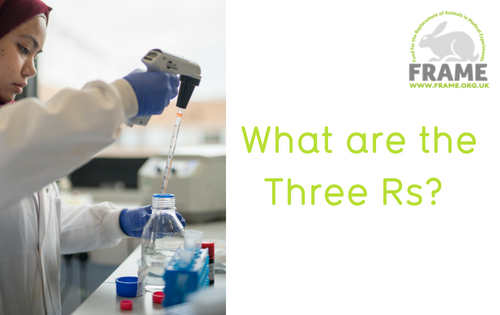 In the first instalment of a two-part blog, FRAME’s senior scientific officer Amy Beale talks about the Three Rs, what they are, how they can be more effectively implemented and whether we will ever be in a position to stop using animals in medical experiments. I first heard about the Three Rs while working for RSPCA Education developing animal welfare-based learning resources and sharing them with teachers. I had been a secondary school science teacher prior to this and went back to the classroom after leaving the charity. 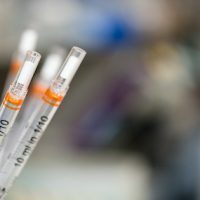 In the GCSE Science curriculum there was, and still is, a requirement for students to know the basic testing and trialling stages involved in developing a new drug. The students must also be given opportunities to ‘appreciate the power and limitations of science and consider any ethical issues which may arise’. Discussing the use of animals in testing always encouraged debate among the students, and I began including the Three Rs in my teaching. 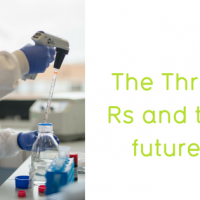 The Three Rs started as an ethos to promote humane animal research, but now provide an essential framework of principles to follow when using animals in experiments. Replacement refers to the idea that if there are proven alternative techniques, methods and strategies available that do not require live animals, then they should be used instead. Reduction means that the number of animals being used in any experiment should be reduced to a minimum. 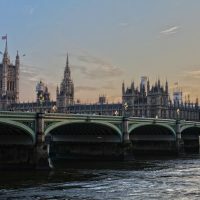 Refinement is referring to the need to refine experimental procedures to minimise pain, suffering, distress and improve welfare for the animals involved. Full replacement techniques do not use any animals at any point in a medical or scientific experiment. These alternative techniques include computer modelling, in-vitro techniques using cells and tissues, imaging techniques, biochemical analysis, genetics and gene profiling, or the use of human volunteers. If you have heard of ‘organoids’ or ‘organ-on-a-chip’ these are cell-based technologies which aim to move closer to predicting whole organ response by, for example, including different cell types from the organ. Partial replacement techniques may use species not protected by the Animals (Scientific Procedures) Act (ASPA) 1986. Species protected by the ASPA include all living vertebrates and cephalopods, such as the octopus. This is based on current scientific evidence regarding the ‘sentience’ of different species and their ability to suffer. Therefore, using an invertebrate species such as Drosophila (flies), rather than a rat or mouse would be considered a partial replacement. In 1986 The Animal (Scientific Procedures) Act (ASPA) was passed to regulate the use of animals for research within the UK. This was the first step to including the 3Rs in legislation and covers the ‘protected’ species mentioned above. The original act referred to precautions being taken to reduce suffering. ASPA has since been updated and now refers separately to the 3Rs principles. In the UK legislation stipulates that anyone who applies for a license to carry out animal research (and there are three licenses currently required by ASPA before animal research is permitted) must show how they have implemented the Three Rs in their research proposal. FRAME firmly believes that the day scientists will develop robust experiments, producing reliable data, that do not require the use of animals. Clearly, this is going to take time. Currently, the UK law both requires and regulates the use of animals in medical experiments. It will likely take many years to build up sufficient evidence that there are better, more reliable alternatives, which is why charities like FRAME need the financial support to enable them to continue their work. Donate now to help support our work.